We have, for the first time, directly quantified evolutionary effects of bear predation on wild salmon populations. Sound fisheries science and a complete understanding of seafood ecosystems are foundational to sustainable seafood, and a pillar of our work. Many wild ecosystems and fisheries are complex and not yet fully understood. Research to better understand these complexities ensures our collaborative efforts with commercial fisheries, local communities, and business result in solutions that stick. Pacific salmon fuel a $3 billion a year industry, support tens of thousands of jobs, and are the staple to many local industries and communities. Salmon are also a significant food source for 137 species, including the Alaskan brown bear. A full understanding of salmon life cycles, reproduction traits, and interactions between human and non-human organisms is required if comprehensive and sustainable salmon management plans are to be effective. One of our fishery scientists, Jocelyn Drugan, recently published an article on the evolutionary and ecological pressures wild salmon populations face in natural ecosystems, looking specifically at effects of brown bear predation on spawning sockeye salmon in the Wood River Lakes system that connects to Bristol Bay, Alaska. 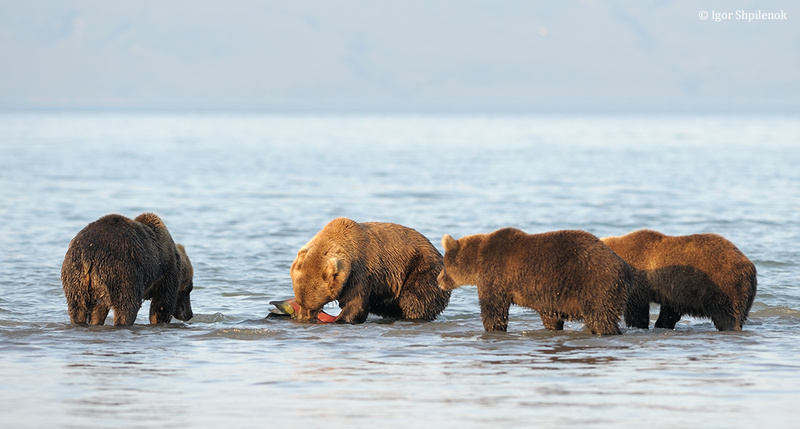 The study focused on two brood years (parent generations), one where bear predation on sockeye salmon was high and the other when predation was low. In this study we have, for the first time, directly quantified evolutionary effects of bear predation on wild salmon populations. In one population, individual adult salmon produced an average of 0.4 returning adult offspring during the high predation year, whereas they produced an average of 1.4 returning adult offspring in the low predation year. This implies the lower the predation rate, the higher the salmon reproductive success rate. Interestingly, patterns of selection were fairly consistent between the high predation and low predation years. In other words, the ‘fittest’ fish (those producing the most returning adult offspring) had similar traits in both the low and high predation year. The traits we looked at were body size, reproductive lifespan (number of days an individual salmon spent in the spawning stream), and time of entry into the spawning stream. We found that fish with longer (but not much longer than average) reproductive lifespans had higher fitness, especially in females. This suggests that females need some minimum amount of time on the spawning grounds to successfully produce adult offspring, maybe to protect their nests (redds) from disturbance by other females. The study also provided insights into evolutionary potential and constraints in these populations. For example, we observed high genetic variation in stream entry date, which suggests selection probably varies among years and maintains high variability in this trait. Maintenance of genetic and phenotypic (physical trait) variation is important in wild populations because variation can increase resilience and adaptability to changing environmental conditions. While these are just a few summary findings from the seven year study, you can learn about bear predation on sockeye salmon from Dr. Drugan in a podcast interview on Heredity (starts at seven minute mark) or by accessing the full publication here.